Know the Code at School is a behavioral and social skill card game that illustrate 50 social skills in typical school scenarios. Each card shows a skill with a relevant photo, lists five sequential steps to accomplish the skill and suggests a talking point. 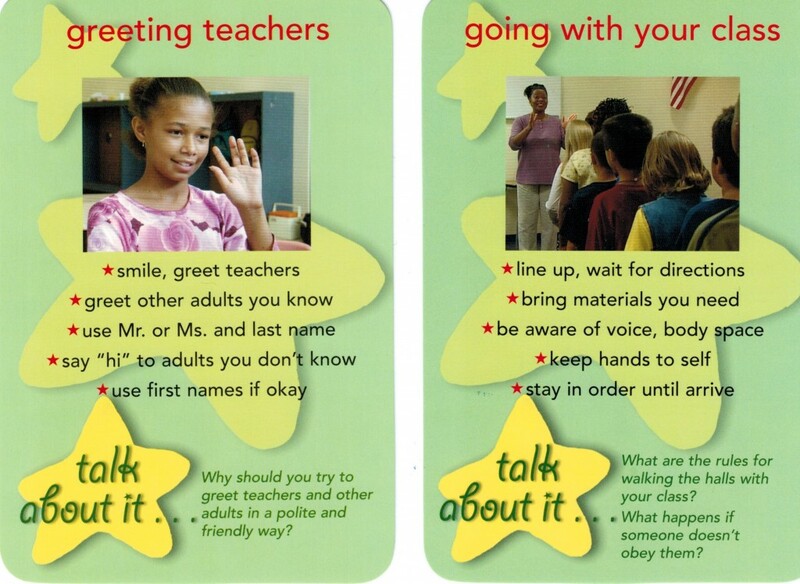 The cards are great for games and role plays at an elementary or middle school level. This week only, save 15% on the Know the Code at School cards by entering the Promo Code BLOGKC9 at checkout. *Offer expires on April 3, 2012 at 11:59 pm EST. Not compatible with any other offer. Be sure there are no spaces after the Promo Code when you enter it at checkout. Written by: Different Roads to Learning on March 28, 2012. This entry was posted in Academics, autism, autistic spectrum disorder, Behavior, Difflearn Promo Code, Pick of the Week, Products, Social Skills, Transitions and tagged ADL's (activities of daily living), autism, autism education, autistic spectrum disorder, behavior management, daily routines, developmental delays, developmental disabilities, School tools, socialization, special needs, students, transitions, visual cues, visual supports by Different Roads to Learning. Bookmark the permalink.